Lynn Henderson is a blonde older woman performing three shows entitled “T’aint Nobody’s Bizness if I do: A Life of Song, swing … and shuffle ball change,” at Don’t Tell Mama this month. She introduced herself to a very sparse opening night audience that included my husband and I, the booking manager of Don’t Tell Mama, a gentlemen who wrote lyrics to two of the tunes composed by her music director, the director of the Mabel Mercer Foundation and 3 others, by telling us about her life. “Fifteen years ago, when my husband told me he wanted a divorce after thirty six years of marriage, I said “Hooray!” She talked about how she bought a horse and rode the horse from Connecticut to Florida and about traveling all over the world. Her song selections are impressive. One significant composer after another: Cy Coleman, Billy Joel, Marilyn and Alan Bergman, Kander and Ebb, Aznavour, Randy Newman, The Gershwins, Jerry Herman and Amanda McBroom. Douglas J. Cohen, her music director/accompanist is equally significant. His arrangements are vivacious, vibrant, toe-tapping and actually make you want to get up and dance. Henderson also included two of Cohen’s own compositions, both with clever lyrics by Laurence DuKore, which Cohen sings with her. When he does, his smile and his artistic pizzazz, bring the stage to life. He instantly connected with me. Cohen was born to entertain. I thought he was terrific. Another highlight of the show was the appearance of Ms. Henderson’s Pilates instructor, Christine Perone, owner and lead singer (with Lance Zitron) of the popular New York City Stomp Society Swing Band, dancing a frisky pony with an uncontrollable tail hopping to Randy Newman’s “You’ve Got a Friend in Me.” Nobody had to say Giddy up to her! In the ads she ran on various sites, she quoted a blurb from Marilyn Maye, who seems to be a mentor. 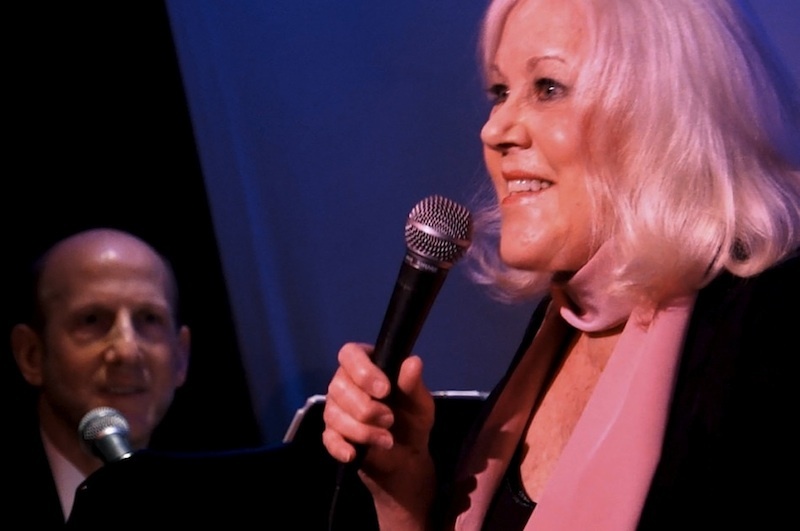 “Lynn’s exuberance and her great love for the art of singing come through beautifully. She delivers the lyrics with understanding, honesty and caring.” Maybe this is so at a master class where she presents one or two songs at a time, but in a long program of 21 songs, her choices were too ambitious for her vocal range. She was lacking the exuberance and vigor in her show. All the vitality in the program came from the playing and singing of her musical director/accompanist Douglas J. Cohen. Toward the end of the program, Henderson’s voice relaxed a bit and seemed more comfortable with “Errol Flynn,” by Amanda McBroom, and “I’ve got a Name,” which fell more into her vocal range. Singing songs you love and want to sing is not enough especially for such a long program. You have to pick songs to suit your voice and your personality.